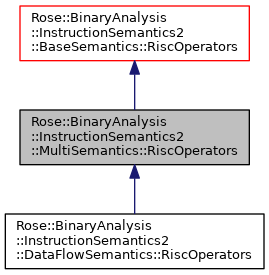 Defines RISC operators for the MultiSemantics domain. Invoking a RISC operation in the MultiSemantics domain causes the same operation to be invoked for each of its subdomains provided all arguments are valid in those subdomains (i.e., SValue::is_valid() returns true). Definition at line 243 of file MultiSemantics2.h. This constructor creates a new MultiDomain RiscOperators object that does't have any subdomains. The subdomains should be added before using this object. The regdict argument is not used in this class and is only present for consistency with other classes and for subclasses. Definition at line 271 of file MultiSemantics2.h. Definition at line 287 of file MultiSemantics2.h. Definition at line 292 of file MultiSemantics2.h. Add a subdomain to this MultiSemantics domain. Returns the identifier (index) used for this subdomain. The name is optional and used mostly for debugging; it is also added to the formatter and can be used when printing a semantic value. The activate argument indicates whether this subdomain is activated (default is true). Activated subdomains will participate in RISC operations if their arguments are defined. See also, is_active(), set_active(), and clear_active(). Returns a formatter containing the names of the subdomains. Definition at line 313 of file MultiSemantics2.h. Returns the number of subdomains added to this MultiDomain. Definition at line 318 of file MultiSemantics2.h. Returns the RiscOperators for a subdomain. The idx need not be valid. Returns true if a subdomain is active. Active subdomains participate in MultiSemantics RISC operations, provided all their operands are valid. This method returns false if idx is out of range or the subdomain's RiscOperators are null. Definition at line 328 of file MultiSemantics2.h. The subdomain's RiscOperators object is not removed or deleted by this method; the subdomain can be made active again at a later time. Definition at line 334 of file MultiSemantics2.h. Makes a subdomain active or inactive. When making a subdomain inactive, its RiscOperators object is not removed or deleted, and it can be reactivated later. An invalid idx is ignored when deactivating; it must refer to a valid subdomain when activating. Called before each subdomain RISC operation. The default implementation does nothing, but subclasses can override this to do interesting things. The idx is the index of the subdomain that's about to be called. Definition at line 345 of file MultiSemantics2.h. Called after each subdomain RISC operation. The default implementation does nothing, but subclasses can override this to do interesting things. The idx is the index of the subdomain that was just called. Definition at line 349 of file MultiSemantics2.h. Definition at line 352 of file MultiSemantics2.h. Called at the beginning of every instruction. This method is invoked every time the translation object begins processing an instruction. Some policies use this to update a pointer to the current instruction. Called at the end of every instruction. This method is invoked whenever the translation object ends processing for an instruction. This is not called if there's an exception during processing. Uses the prototypical value to virtually construct the new value. Uses the prototypical value to virtually construct a new value. Invoked to filter call targets. This method is called whenever the translation object is about to invoke a function call. The target address is passed as an argument and a (new) target should be returned. Invoked to filter return targets. This method is called whenever the translation object is about to return from a function call (such as for the x86 "RET" instruction). The return address is passed as an argument and a (new) return address should be returned. Invoked to filter indirect jumps. This method is called whenever the translation object is about to unconditionally jump to a new address (such as for the x86 "JMP" instruction). The target address is passed as an argument and a (new) target address should be returned. Construct a floating-point value from an integer value. Construct an integer value from a floating-point value. The bits of fpValue are interpreted according to the fpType and converted to a signed integer value that fits in integerWidth bits. This is done by truncating the fractional part of the floating point number, thus rounding toward zero. If fpValue is not a number then dflt is returned. Convert from one floating-point type to another. Converts the floating-point value a having type aType to the return value having retType. Whether a floating-point value is a special not-a-number bit pattern. Whether a floating-point value is denormalized. Whether a floating-point value is equal to zero. Whether a floating-point value is infinity. Returns true if the floating point value is plus or minus infinity. Querying the sign bit will return the sign of the infinity. Returns the value of the floating-point sign bit. Returns the exponent of the floating point value. For normalized values this returns the stored exponent minus the exponent bias. For denormalized numbers this returns the stored exponent minus the exponent bias minus an additional amount to normalize the significand. Adds two floating-point values that have the same type and returns the sum in the same type. Subtract one floating-point value from another. Subtracts b from a and returns the difference. All three floating-point values have the same type. The default implementation is in terms of negate and add. Multiplies two floating-point values and returns the product. All three values have the same type. Divide one floating-point value by another. Computes a divided by b and returns the result. All three floating-point values have the same type. Computes and returns the square root of the specified floating-point value. Both values have the same type. Truncate the fractional part of the floating point number.